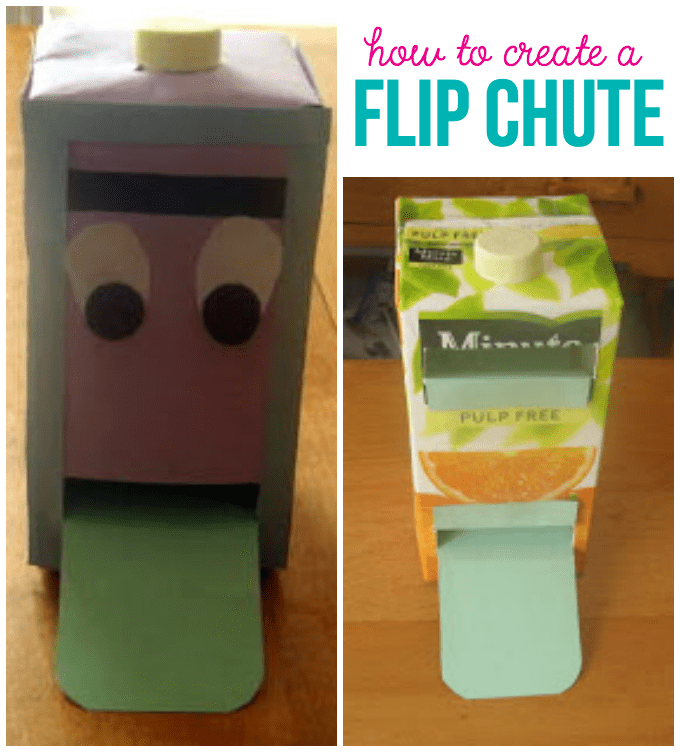 I remember learning to create a flip chute as an undergraduate in college studying early childhood education. They are so easy to make and can literally be used to review every skill. Who knew a simple juice or milk carton could become a fun way to learn? 1. Mark 1 ½ inches from the top of the carton and draw a line across. Do the same thing an 1 inch below that first line. 2. Mark a line connecting the top two lines together at each end. 3. Mark 1 ½ inches from the bottom of the carton and draw a line across. Do the same thing an 1 inch above the bottom line. 4. Connect the bottom to lines together at each end. 5. Cut out the rectangles you have drawn at the top and the bottom of the carton to make the slots. 6. Open the top of the milk carton. Cut along the folds on the sides of the top carton to create flaps. 7. Cut a piece of tagboard into a strip 6 ½ inches by 3 inches. 8. Cut a second piece of tagboard into a strip 7 ½ inches by 3 inches. 9. Cut rounded edges on one end of the long stip. This strip will be the tongue. 10. Place a longest into the bottom slot and pull it upward to the top of the carton. Tape it top of the longer strip about ½ inch from the top of the carton. 11. Fold the shorter strip up about ½ on each end so that it will curve out of the carton when it is placed inside. 12. Place the shorter strip in the top slot and tape it into place outside the carton on the folded area. 13. Feed the bottom of the shorter strip through the bottom opening and crease the fold, but don’t tape yet. 14. Take a piece of scrap cardstock and test out chute to make sure the card will go through it. You can make the curve larger or smaller in the carton if you need to. 15. Attach the bottom of the small piece of cardstock when you have the chute working properly. 16. Fold down the flap on top of the box and tape it down. 17. Decorate the outside of the box with contact paper or cardstock to create creature or learning machine. The card for the flip cute a super easy to make. 1. Cut index card in half. 2. Cut a off the bottom right hand corner of each card. You will put the question or the problem you want answered on the cards with this bottom corner removed. 3. Turn the cards over and write the answer on the cards with the missing right hand corner facing up. For more fun craft ideas, check out my crafts’ section on my site. Thank you so much for the opportunity to share this learning tool. Cool idea! I’ll have to file this away. Thanks! Great idea! I love to do crafts and activities with recycled objects. Pingback: Flip Chute for You!